Leave a Comment on Samsung rolling out August 2018 Android Security Patch right now! Samsung is about to launch its latest flagship phone from the note series called the Galaxy Note 9. Most of the Samsung enthusiasts are excited about the new Note 9 device due to several reasons. Some of which include the new SPen with Bluetooth connectivity, a larger battery which can last throughout the day, and much more. As rumors suggest, it will also feature Android 8.1 Oreo based on Samsung Experience 9.5. However, before the phone launches, Samsung is making sure its sales are not affected due to update history. The manufacturer has stepped into the update game and is now rolling out August 2018 Security Patch to the Galaxy S8 Plus devices. This is even before Google rolled out the August update for the Pixel devices. 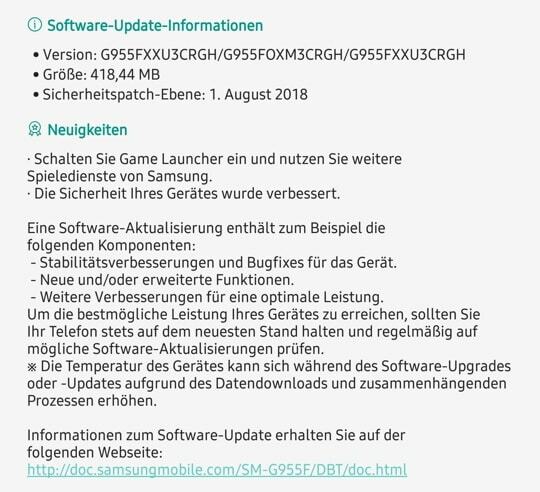 The new OTA update from Samsung is currently only available in the European region and the first country to receive it is Germany. This will take your Galaxy S8 Plus to new firmware build number G955FXXU3CRGH and for the S8 it is most likely G950FXXU3CRGH build. Moreover, the OTA is for the international (global) variants SM-G950F/FD and G955F/FD. The US, Canadian, Australian, and Unlocked variants of S8 and S8 Plus will soon receive the same by the end of August. Software version: G955FXXU3CRGH / G955FOXM3CRGH / G955FXXU3CRGH. 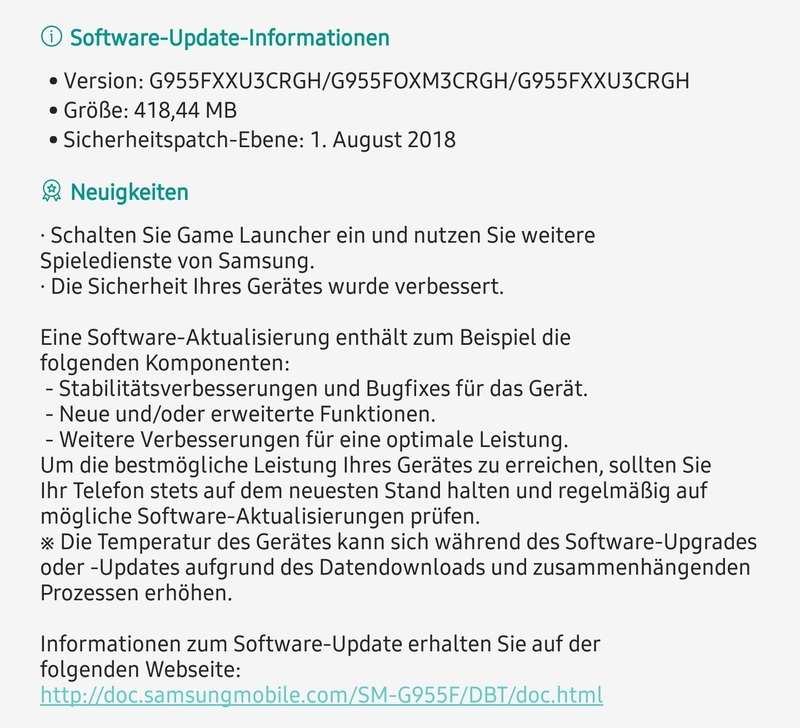 OTA size is 418.44 MB and Security Patch Level is August 1, 2018. Apart from the security patch, Samsung also suggests to turn on Game Launcher and get more gaming services from them. It also includes some security features, stability improvements, bug fixes, some new or advanced features for the device. How to update Samsung Galaxy device to August 2018 Android Security Patch? The easiest way to update your Galaxy device is go to Settings > Software Updates > Download OTA updates manually. If you don’t see any OTA update, you can flash the full stock firmware and install it using the latest Odin tool. Visit our Samsung Galaxy S8 and S8+ tutorial on how to download latest stock firmware. Later, you will need to visit this detailed tutorial on how to install Samsung stock firmware and flash it using Odin. Samsung will soon roll out Android P Beta for Galaxy S9 and S9+. So stay tuned.